Web 2.0 technologies are designed to be open, flexible, and collaborative offering many tools to support traditional or non-traditional tele-mentoring activities. The benefit of effortless sharing and connectivity comes with challenges in how we view such things as ownership, privacy, and duplicity. The Web 2.0 toolkit includes applications for web-based note-taking, shared documents, feedback, reflection, informal discussion, and presentation. The collaborative opportunities provided by mashable, social networking platforms allow users to flex time, geography, and projects. Professional educators continue to inform their practice and explore new ways to meet the needs of students. Web 2.0 technologies can support educational professionals by opening doors and classrooms world-wide. 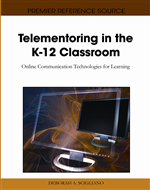 The chapter makes a comparison between online and mentoring instructional practice and highlights models for educational use of and aids in identification of tools for mentors and mentees. It is our challenge as teachers to create meaningful engaged learning experiences for students. We look for better ways to build connections in disciplines, learning outcomes, and the real world. Often the search centers on technology. When incorporating technology into an engaged learning process, educators must be willing to adjust or experiment with various applications and technology tools to determine what will best work for a given curriculum objective. (Bowen, 2000) However, the task of locating, acquiring and using technology in the classroom has, traditionally, been both time consuming and complex. If a classroom teacher were to employ technology, the room, equipment, software, operating system, and/or license were all potential barriers to success and a prudent use of time. Barriers such as browser compatibility, platform dependence, lack of home or school computing resources, and time often waylaid; and, over time, taught that technology adaption, whatever it was, was not worth the risk. Fortunately, the last fifteen years has brought rapid and lasting change. The Internet helped classroom teachers overcome many barriers by making the right software and equipment easier to find. As Internet access increased, schools implemented interdisciplinary curricula and themes around Internet-based technologies. A driving force of this change was the opportunity to use authentic tasks and collaborate in learning communities in a constructivist approach to learning. Project based learning became far easier for students to accomplish using the resources of the web. Such projects “ask students to perform challenging and authentic tasks, align curriculum, instruction, and assessment into one seamless experience” (Jones, Valdez, Nowakowski, & Rasmussen, 1995).